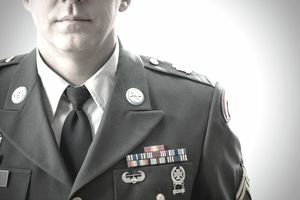 Typically a soldier's time in service, the time he/she started boot camp to the present, and the performance of that soldier will determine the promotion status of a military member. Special performance can earn an early promotion in exceptional soldiers. Poor performance may not make the next higher rank as well. The time-in-service requirement for attaining eligibility for promotion to SGT is 36 months Active Federal Service for the primary zone and 18 months for the secondary zone. (Note: The secondary zone is a Below-the-Zone Promotion Program. Commanders can select HIGHLY QUALIFIED enlisted personnel for early promotion consideration. This is known as "Secondary Zone" Promotion). The time-in-grade requirement for attaining eligibility for promotion to SGT is eight months as a CPL/SPC, waiverable to four months for those recommended in the secondary zone. Soldiers in the secondary zone may be boarded with 16 months time-in-service and four months time-in-grade as of the first day of the board month. The time-in-service requirement for attaining eligibility for promotion to SSG is 84 months Active Federal Service for the primary zone and 48 months for the secondary zone. The time-in-grade requirement for attaining eligibility for promotion to SSG is 10 months as a SGT, waiverable to five months for those recommended in the secondary zone. Soldiers in the secondary zone may be boarded with 46 months time-in-service and five months time-in-grade as of the first day of the board month. The minimum promotion point score for attaining recommended list status for promotion to SGT is 350. The minimum score for attaining recommended list status for promotion to SSG is 450. The service remaining requirement is six months for promotion to SGT and 12 months for promotion to SSG. Soldiers competing for promotion to SSG must be graduates of the Primary Leadership Development Course (PLDC) prior to being recommended for promotion. Soldiers competing for promotion to SGT/SSG must possess either a high school diploma, GED equivalency, or an associate or higher degree. Each month the Department of the Army establishes the total number of soldiers to be promoted based on budgetary and strength constraints. The number of promotions is allocated by Primary MOS (job) within these constraints. Department of the Army promotion cutoff scores are announced monthly. Soldiers who meet or exceed the announced cutoff score are promoted if otherwise eligible. * Language specific MOS (97E and 98G) have announced cutoff scores by language identifier; therefore the PZ AVG / SZ AVG columns for these MOS are indicated by asterisks.